Is é an Naíonra ná grúpa paistí faoi threoir mhaoirseora. Tagann siad le chéile ar feadh trí h-uaire in aghaidh an lae i dtimpeallacht shuáilceach ina mbíonn siad gnóthach agus sona ag glacadh pairte i ngniomhaíochtaí atá oireannach da n-aoisghrúpa. Cuireann an maoirseoir struchtúir ar an timpealllacht chun déanamh cinnte go mbionn cúram déanta go bhfuil gach gné de fhorbairt iomláin an phaiste a sholáthrú is in éineacht le seo ag tabhairt an deise do/dí an Ghaeilge a fhoghlaim go nadúrtha trí mhean an shúgartha. 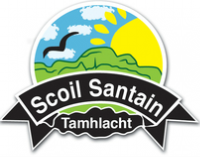 Tathar ag suil go bhfoghlaimeoidh an páiste an Ghaeilge sa chaoi céanna inar fhoghlaim sé/sí an Béarla, trí éisteacht le focail agus á dtuiscint agus faoi dheireadh ag rá na bhfocal, na bhfrásaí agus na n-abairtí. Makes us happy, one and all. Come and see us, it's as easy as that. When they are left waiting, it makes them sad. Get them off on the right track. Grúpa Maidine: 8.30 r.n. - 11.30 r.n. Grúpa Tráthnóna : 12.00 - 3.00 i.n.